Get ready to explore the beautiful Northern Territory! This ten-day round trip adventure begins and ends in Darwin, a youthful city known for its tropical climate, open-air markets, vibrant nightlife and delicious seafood. The first leg of your journey takes you to the wetlands and monsoon forests around the Mary River, and then you're off to explore Kakadu National Park, with its ancient Aboriginal rock art, waterfalls and awe-inspiring gorges. From Kakadu, you will travel to the gold rush town of Pine Creek, known for its historic buildings and railway museum. Next up Katherine and the nearby Nitmulik National Park and the Katherine Gorge, followed by a drive down to Daly Waters, home of the first international airport in Australia and a legendary Outback pub. The final leg of your trip takes you up to Batchelor, gateway to the Litchfield National Park with its picturesque Wangi Falls and magnetic termite mounds. Finally, you return to Darwin for two days of fun and great food. The first leg of your trip takes you 180 km east (about two hours) via the Stuart and Arnhem Highways to the beautiful Mary River. Home to large saltwater crocodiles, numerous migratory birds, and other wetland wildlife, the Mary River region has also been home to the Limilngan Wulna Aboriginal people for thousands of years. In addition to the Mary River, the region also includes the Adelaide River, hence the plethora of river cruises available to visitors. Perhaps the most famous for abundant barramundi, the Mary River region is paradise for anglers. Located on the Arnhem Highway, this park was built in the days when hunting buffalo and crocodile were key. Amenities include a swimming pool, laundry facilities, BBQs, restaurant, art gallery, shop, bar, and wildlife sanctuary. Choose from self-contained, air-conditioned cabins, a hostel for backpackers, or private powered and unpowered sites. Located in the Mary River National Park area, Shady Camp is one of the best spots for Barrumndi fishing. In fact, they are literally jumping right out of the water. A viewing platform gives you a glimpse of saltwater crocodiles, and terrific sunsets. Corroboree Billabong is another great place for barramundi fishing. Located near the Point Stuart Wilderness Lodge, Jimmy's Creek Monsoon Forest offers a different glimpse into the Mary River wildlife, with giant banyan trees and wetland wildlife. A moderate walk (about half an hour) takes you along the banks of the creek. Drive approximately 119 km east (just over an hour) via the Arnhem Highway to Jabiru on the eastern end of Kakadu National Park. The only town in Australia located in a National Park, Jabiru is one of the few places in the area where you can stock up on supplies. Plan to spend two nights in Jabiru, to make the most of Kakadu National Park. Designated a World Heritage Site for the numerous Aboriginal rock art sites, the Kakadu National Park is home to many different Aboriginal cultures who have lived in the region for 50,000 years. Go with an Aboriginal tour guide or set out on your own on one of the many walking trails, taking you past important Aboriginal sites, waterfalls, gorges, wetlands, and plunge pools. A 'must see' while visiting Kakadu National Park, the 150-metre high cliffs surround a clear plunge pool with white sandy beaches. Due to the fact that the site can only be accessed via 4WD vehicle, and is part of the Arnhem Land escarpment, which requires permission to visit, consider signing up for a 4WD tour. Drive 212 km south (a little over two hours) to the sleepy little town of Pine Creek. Founded in 1870 during the construction of the Overland Telegraph, Pine Creek is the only remaining mining town in the Top End. 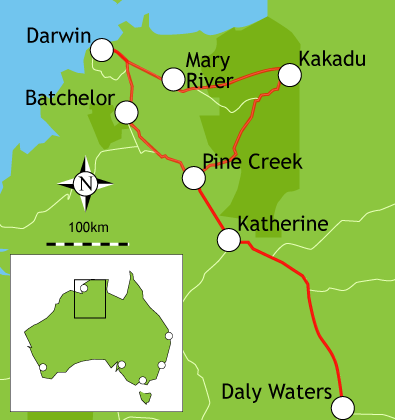 In addition to the gold rush, which began in 1871, Pine Creek is also known for the Northern Territory Railway, which ran from Pine Creek to Darwin. Numerous historical buildings are located in Pine Creek, including the oldest pre-fabricated structure in the Northern Territory. The town is known for several events, including the Pine Creek Gold Rush and Didjeridoo Festival in June, which features the gold-panning championships and didjeridoo performances. Located on the Stuart Highway in Pine Creek, this pet-friendly park is not far from Kakadu National Park. Choose from powered and unpowered sites, or powered sites with ensuites. Call (08) 8975 1177 for information. Once the last stop on the 19th century unfinished transcontinental railway system, Pine Creek's development once depended on the railway. See one of the only remaining original Beyer Peacock locomotives, Miner's Park, and a machinery maintenance area for the preservation of equipment from mines no longer in use. An interpretive center, picnic area, and shelter are also on site. The oldest prefabricated building in the Northern Territory; the National Trust Museum was once the home of the mining warden in Barrundie. The structure was moved to Pine Creek in 1913 and now houses the museum and the town library. Learn about the history of Pine Creek, including its Chinese population, the gold rush, and the Overland Telegraph line. At one time, Chinese emigrants in their thousans, lived in Pine Creek. The Old Bakery is one of the last remaining structures from that era. Built in 1908 and moved to Pine Creek shortly thereafter, the Old Bakery was built of corrugated iron and represents the huts that many Chinese lived and operated businesses from in the late 19th and early 20th centuries. Today your journey takes you just 90 km south (a little over an hour) via the Stuart Highway to Katherine. The third largest town in the Northern Territory, Katherine is the center of the Katherine region, which covers 480,000 sq km. Europeans began exploring Katherine in 1844, and the town and the river that runs through it were named by John McDouall Stuart in 1862. The town and nearby areas offer numerous outdoor experiences ' a true nature lover's paradise. Home to the Jawoyn and Dagomen Aboriginal people, Katherine was renamed 'Nitmulik' in 1989 when the original people gained the title to the land. The town and the region are still referred to as Katherine, but the nearby Nitmulik National Park reminds visitors of its true name. You could spend days exploring the 292,800-hectare Nitmulik National Park, with its 13 gorges, waterfalls, lookouts and 100 km of walking trails. Start out at the Nitmulik Visitor's Centre to get oriented. Located at the Katherine Gorge entrance, about 30 km northeast of Katherine via sealed roads; the Nitmulik Centre offers information about the local geology, flora, and fauna, as well as walking trails and other park activities. By far the most popular spot in the Nitmulik National Park is the Katherine Gorge, covering 12 km with 70-metre high walls. Hire a canoe, bring your own boat, or book a boat cruise to enjoy this magnificent site. Lure fishing is permitted, but check with park rangers for bag limits and other rules. Located about 5 minutes from the town of Katherine, the thermal hot spring pools wind through the trees along the Katherine River. With a constant temperature of 32' C, the hot springs are a perfect place to enjoy the river. Walking trails, picnic areas, and toilet facilities (including disabled) are also on site. Established in 1878, the Springvale Homestead is the oldest original homestead in the Northern Territory. Tour the grounds, including a display of photographs and other information about the history of the homestead. Guided tours and Devonshire Tea are offered from May through September. Katherine has a great deal to offer, but if you feel the itch to hit the road, make your way 272 km south (about 3 ' hours) via the Stuart Highway to the famous watering hole, Daly Waters. As are many of the towns in the Northern Territory, Daly Waters bears the stamp of John McDouall Stuart, who named the town in 1862 in his third and final attempt to travel Australia from South to North. Conveniently located at the intersection of the Carpentaria and Stuart Highways, this park features an Internet caf', swimming pool, free BBQs, laundry facilities, TV lounge, game and rec room, licensed restaurant, kiosk and tour desk. Choose from motel accommodations, self-contained units, powered and unpowered sites, and powered ensuite sites. A registered heritage attraction, the Daly Waters Aviation Complex (Daly Waters Aerodrome) is the first international airport in Australia, and the oldest aviation building in the Northern Territory. See the original Qantas hangar learn about the airstrip's involvement in World War II. Just a short walk from the Daly Waters Pub is a unique museum showcasing historical memorabilia, photographs and documents pertaining to Daly Waters up until World War II. The longest drive day on your itinerary, this leg takes you 506 km north (about 6 ' hours) via the Stuart Highway to Batchelor, gateway to Litchfield National Park. Now primarily devoted to tourism, Batchelor had its own minor gold rush and served as the Allied Air Force Base during World War II. The area is also famous for nearby Rum Jungle, named for legendary rum drinking binge and the site of a uranium mine from 1951 to 1963. Plan to spend two days exploring Litchfield National Park and other attractions for nature and art lovers. Declared a National Park in 1986, the Litchfield National Park covers 1,500 square km of forests, rivers, waterfalls, and the sandstone plateau known as the Tabletop Range. Sealed roads give visitors easy access to major attractions, and the park is accessible throughout the year. Stop in to the Park Headquarters in Batchelor to get oriented, and for information about bush walking trails and permits. Hands down, the most popular spot at Litchfield National Park is Wangi Falls, one of three spring-fed waterfalls cascading from the sandstone plateau; the other falls are Tolmer and Florence). Wangi Falls are the biggest in the park, its waters flowing into a swimming hole surrounded by monsoon rainforest. Swim, snorkel, or spend then entire day; Wangi Falls has numerous amenities, including disabled bathrooms, picnic areas, sheltered areas, BBQ facilities, a car park and a kiosk. Take the three km interpretive walking trail. Operated by the Batchelor Institute of Indigenous Tertiary Education, the Coomalie Cultural Centre presents exhibits, cultural projects, and a shop where visitors can purchase Aboriginal arts and crafts. The Centre is located on the road to Litchfield National Park, and features a bush tucker garden and mural created by Batchelor Institute students. On the last leg of your trip, drive 98 km north (about an hour and half) via the Stuart Highway to Darwin. This multicultural city has the largest population of Aboriginal residents (proportionately) of any Australian capital city; the Larrakia have lived in Darwin and the surrounding areas since before European Settlement in the late 1800s. The city is also home to many people of South East Asian descent, and is considered Australia's gateway to Asia. Located on the coast of the Timor Sea, the Darwin has a thriving wharf and harbour, most of which can be traveled using the city's extensive bike paths. Darwin is known as a 'young' city, exemplified by a vibrant nightlife, mostly concentrated on Mitchell Street. World class cuisine with seafood as the star, rich cultural and art experiences, open air markets and beautiful gardens make Darwin a city worth at least two days of your itinerary ' if not more! Make your way down to Darwin's wharf for spectacular views, local history, and a plethora of shops and restaurants. Visit the Indo Pacific Marine at the base of Stokes Hill Wharf to learn about coral reef eco-systems, and take the 'Coral Reef by Night' tour, which includes a seafood buffet. Also make time for the Australian Pearling Exhibition, a museum detailing Darwin's pearling history. Cullen Bay offers the best in harbourside dining, with famous eateries like the Buzz Cafe, abundant seafood, and breathtaking sunsets. Call ahead to find out about entry fees and if reservations are needed.